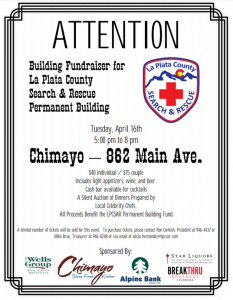 Our Annual Famous Chimayo Fundraiser. Join us for Good Food, Good Wine (and Beer) to support LPCSAR. A completely voluntary organization, we depend on the community to help support our activities and training. We are SO close to obtaining a permanent facility. We need your help to push us over the hump. Your Donations will help us apply for a matching grant that can make this project a reality. Their standard joke is that if we go eat their pancakes, they’ll come to our rescue. Putting on their chef’s hats for La Plata County Search & Rescue’s Pancake Breakfast on Sunday at the fairgrounds are Dan Long, who heads up the Communications and Subterranean teams, and Rae Randolph, who is on the Canine Team and handles German shepherd Oso. That equation offered by La Plata County Search & Rescue doesn’t seem like a fair equivalency to me. Shouldn’t we be serving them pancakes so they’ll come to our rescue? Maybe that’s a discussion we, as a community, need to have. Before I get to the flapjacks, I want to start with a few facts about Search & Rescue. It is 100 percent volunteer. The county doesn’t pay them, and they pay for their own training and equipment. Really. That has stuck with me. They don’t just have locals’ respect, they are respected in the state. They practice techniques on snow and heights as well as in water and caves. They train on horses, ATVs and snowmobiles. They learn emergency medical skills. They drill on avalanche rescues and ice climbing situations. They practice complex rescues, coordinating air and land personnel. If something happens to me in the backcountry – and I hope it won’t be because I did something stupid – these are the folks I want coming to get me. They shouldn’t have to risk their lives because we took a careless risk with ours. Which brings me to the Snowdown Search & Rescue Pancake Breakfast on Sunday. A long tradition – President Ron Corkish says they’ve been doing it for at least 25 years, his tenure with the organization. It’s a critical component of the organization’s annual budget, bringing in almost one-third of its budget. The menu is simple and delicious: regular or raspberry pancakes, scrambled eggs and ham. This year they fed almost exactly 800 people, Corkish said, making it a good year for them. Mike Bruce, who was working on ticket sales at the door, said he was delighted that many people would give them a $10 or $20 bill to buy a ticket and tell them to keep the change as a donation. Carver’s Brewing Co. gets perhaps the biggest shout-out. Corkish said Bill and Jim Carver, along with chef Dave Cuntz, make the breakfast possible. CJ’s Diner, Desert Sun Coffee Roasters and Kassidy’s Kitchen also help make the food and beverages happen. Kiwanis Club of Durango, the group that offers the granddaddy Pancake Day of the year, help with the griddles, and Snowdown advertising allows them to reach a bigger audience. La Plata County may not be able to pay volunteers for their services, but they do provide the Exhibit Hall at the La Plata County Fairgrounds to help with the venue. City Market contributes toward the last-minute supply run that is inevitable with an event of this size. Oh, and did I mention the 110 merchants who donated items for the silent auction? I thought not. Sunday was also a bittersweet day for the La Plata County Search & Rescue folks. They were celebrating Corkish’s recent honor as Volunteer of the Year at the Durango Chamber of Commerce awards. Corkish used his acceptance speech as an opportunity to laud his fellow volunteers. And they were grieving the death Friday of ice climbing guide and fellow search and rescue volunteer Mark Miller. Miller was an instructor for Rigging for Rescue out of Ouray, a technical rope rescue organization. 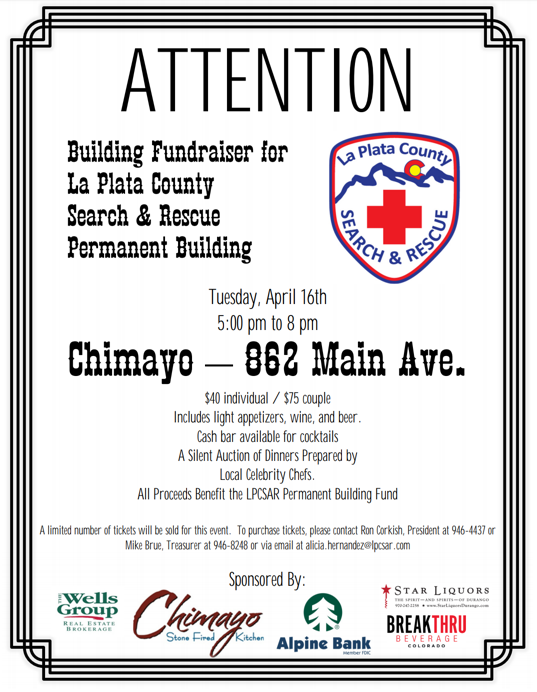 Missed the pancake breakfast and want to support La Plata County Search & Rescue’s efforts? Make a donation and send it to P.O. Box 1885, Durango, CO 81302; or via PayPal at www.laplatasar.org. One can never end a story about La Plata County Search & Rescue without encouraging people to buy their Colorado Outdoor Recreation Search and Rescue card. It’s not pricey, $3 for one year and $12 for five. If you have a hunting/fishing license or boat/snowmobile/ATV registration, you’re already covered. Funds go to a state Search and Rescue Fund to reimburse teams for expenses, which can run thousands of dollars. If there’s money left over in the fund at the end of the year, it’s distributed to search- and-rescue organizations around the state for training and equipment. The card doesn’t cover expenses for medical transport, such as if you’re having a heart attack in the backcountry, but it does cover expenses for the search portion of the rescue. I know people who say they’re “just” going for a day hike on Animas Mountain or above Purgatory and think they don’t need the CORSAR card. But it only takes one misstep to break an ankle. Cards are available locally at virtually every outdoors-equipment outfitter, state parks, the San Juan Mountains Association, and even, for Pete’s sake, Wal-Mart – the list is available online at https://dola.colorado.gov/sar/vendors.jsf. Or, if you’re going online anyway, go to https://dola.colorado.gov/sar/orderInstructions.jsf and buy it there. Which led me to ask the question: Who is Pete, and why do we care about his sake? My ability to wander off on side tracks makes one wonder how I ever finish a column, doesn’t it? It’s apparently a milder oath used as a substitute for the stronger “Christ’s sake” or “for God’s sake,” which may refer to Saint Peter or is perhaps influenced by for pity’s sake, according to Wiktionary and the Grammarphobia Blog. Corkish said pancakes or not, they’ll come to our rescue, 365 days of the year.